Jock Stein once famously declared that “football is nothing without fans.” But football has changed over the past 30 years. The globalised success of the Premier League since its inception in 1992 has seen media coverage and money in the game grow to incomprehensible heights. Indeed, the money involved in football has exploded to the point that 11 of the 20 clubs competing in the 2016/17 Premier League season would have made profits even if they had played their games in empty stadiums. No fans were necessary. Perhaps this shouldn’t come as a surprise, though: Rupert Murdoch’s BSkyB recently secured the next three years of broadcasting rights for England’s top division by paying £3.57bn, a staggering amount of money. But it doesn’t end there for the Premier League; there are other mammoth deals with entities such as BT Sport, Amazon and various international broadcasters. With Sky included, it amounts to a colossal £8.4bn under the 2016 to 2019 deals. This exponential growth has peaked at a difficult time in Britain. Brexit casts an increasingly dark – or rather, depending on your point of view, farcical – shadow over the country with the current government in complete disarray, and communities are feeling the effects of eight years of slow bleeding austerity. Homelessness in Britain is at an all-time high with up to 170,000 people affected. The NHS is haemorrhaging money, staff and resources with no sign of a sufficient financial infusion to rescue it before the vampiric Richard Branson types swoop with a dastardly laugh and Americanise the free (for now) National Health Service. And just as concerningly, more people than ever are utilising food banks, leading to severe criticism from a human rights expert from the UN. Clubs are representative of the areas they are born in … or at least they used to be. 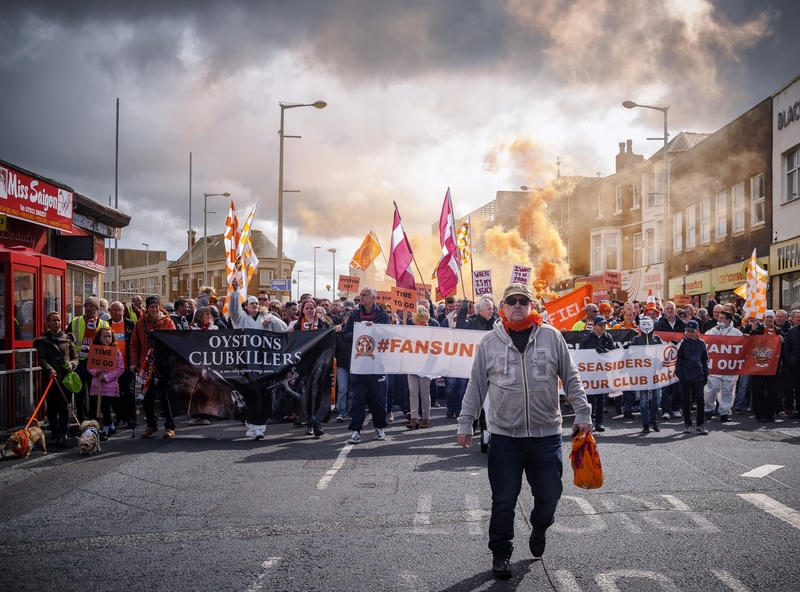 If clubs no longer need fans to attend games to ensure they generate a profit, what sort of impact does this then have on the local fans that are suffering in an age of austerity? What effect does this have on a sport that has always been seen as working class? Some insight comes in the form of Sunderland ‘Til I Die, Netflix’s documentary that covers Sunderland’s dismal 2017/18 relegation season from the Championship. Considering the humiliating relegation Sunderland suffered the previous campaign, welcoming cameras behind the scenes of a modern club was a brave decision by Sunderland’s former, and much loathed, American owner Ellis Short. Originally conceived as an idea to improve the board’s image with their seething fan base in what they brazenly assumed, like most betting predictions, would be a triumphant return to the Premier League, the tragi-comic reality makes for a compelling eight episodes. It’s a series that features rarely shown footage of transfers, training sessions and some fascinating, intimate interviews with members of the Sunderland playing staff. The episode that focuses on midfielder Jonny Williams’ difficulty with the mental health obstacles that come with being a young man in an unfamiliar environment whilst overcoming a serious injury particularly affecting. This is far more than a documentary about football. It’s a study into clubs, fans and the area they are all born in. It’s about the disconnect between all three. The producers behind the show, Fulwell 73, are Sunderland fans themselves and understand this by lovingly casting the supporters as a vital cog of the footballing machine, one just as important to the club as the players. The above quote by diehard fan Peter Farrer comes before the season has started, shown on a drive through the city of Sunderland overlain with industrial images of yesteryear when it was thriving. The scene culminates with the image of the Stadium of Light rising above decrepit and unused factories. It’s one of Britain’s foremost stadiums, used to stage England games and concerts, and the home of Sunderland AFC, but completely out of place in an area so deprived. It is a harrowing juxtaposition. There’s a certain cruel irony that the rapid freefall of Sunderland as a football club should occur during an age of austerity featuring stringent government cuts comparable to another Conservative-led government. During the 1980s, Margaret Thatcher was the figurehead of the Tory government that oversaw the closure of traditional industries in the area. She remains a vehemently hated figure in the North East of England. What was once dubbed “the largest shipbuilding town in the world’”, Sunderland is now a difficult place to live, largely ignored by Parliament. There was once a time when the city used to produce 25 percent of all ships built in the world, with 16 active shipbuilding yards. Now there are none. The last one closed in 1988. Journalist Sam Diss talks about how a stadium matches the identity of the team – and you cannot understate the importance of the Stadium of Light to the people of Sunderland. Situated on the site of the last working coal mine, the city’s other traditional industry, there is a Davy Lamp monument near the entrance in tribute to the Monkwearmouth Colliery mine that brought so many jobs to the area. More recently, government funding in the area has halved since 2010 leading to spending cuts and even more job losses. Employment in the area is below the national average and a third of the children in Sunderland are living in poverty. That’s over 17,000 kids. And this is happening in a major city in one of the richest countries in the world. It’s not so difficult to see why people invest so much of themselves into football. Deindustrialisation on such a vast scale, coupled with a complete lack of investment, means that there really isn’t much else for the people of Sunderland to cling to. It’s only natural that people look outward, for an escape, for something else. That something that takes their minds away from the worries of work, rent and how you’re going to feed your children. Clubs are born from their surroundings. They reflect the society from which they are built. Unfortunately for Black Cats fans, that reflected on the pitch with the team offering up what can only be described as a catastrophic season. In 2017/18, football was sadly not a way out from the relentlessness of real life; it was merely a distraction. 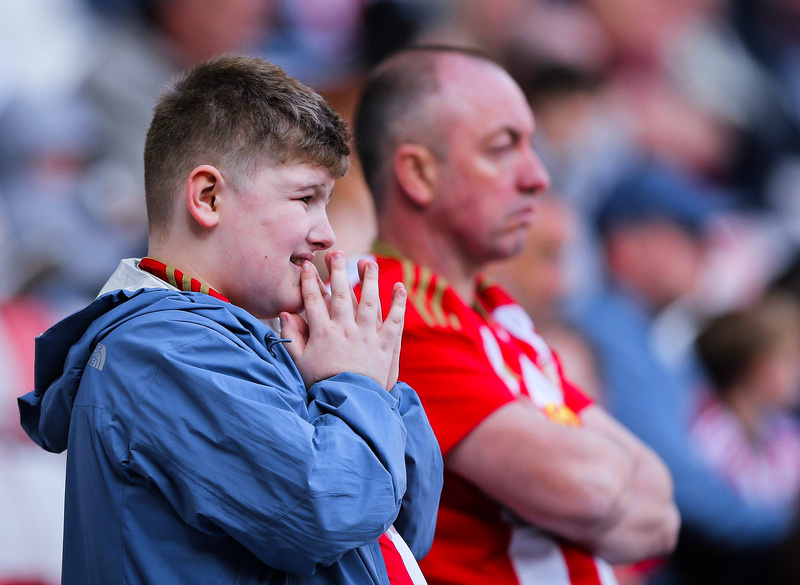 Despite the calamitous football that took place in front of them, the fans of Sunderland retained a positive, blind optimism so forceful throughout the season it almost masks the reality. The supporters are our narrators through this. 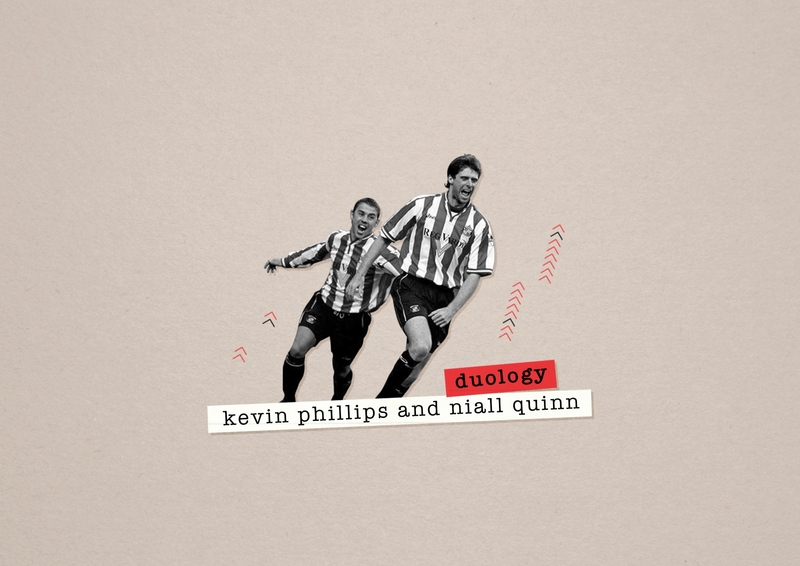 Andrew Camiss has inked his body with images of Sunderland legends: Peter Reid, Niall Quinn and Kevin Phillips, and he tunes in religiously using his radio, another notable declining industry more related to a bygone era. And it’s through his optimistic eyes we see Sunderland heroically rescue a point in the 92nd minute against Bristol City. His relief washes over you, almost making you miss the fact the result meant Sunderland drifted further away from safety. The David Brent-esque figure of chief executive Martin Bain was also concerned, but it’s difficult to feel sympathy for the man who has made so many key decisions in Sunderland’s decline, especially when he expresses his worry in the presence of bodyguards on the way to his top of the line Range Rover. It is entirely predictable and indicative of today’s society, showing the cavernous difference between the privileged and the poor in Britain. Martin Bain gets to leave Sunderland by pocketing who knows what unbelievable sum of money, whilst the local community are left to pick up the pieces of something they hold so dear. The disconnect and the divide between owner and fan is unfathomable. Jock Stein once famously declared that “football is nothing without fans”, but this isn’t true anymore. In some parts of Britain, the fans are nothing without the football, largely because there is nothing else and nowhere else for them to turn. Everything has been stripped down, leaving a sad picture of football in the north of England and a lamentable indictment on modern-day Britain.